name Tetsujin (Iron Man, no relation) 28 is said to be the first who was treated as a good guy, defeating menaces of his own. He started doing so in manga form back in 1956, when cartoonist Mitsuteru Yokoyama started making stories about him for Tokyo's Shonen magazine. The animated version came in 1964. In New York, producer Fred Ladd, who was working on the feature Pinocchio in Outer Space and the TV show The Big World of Little Adam, was already interested in a U.S. version, having seen it in comic book form. He'd already had some experience importing animé to America — he'd been involved in the Americanization of Astro Boy. By January 1966, Ladd's Delphi Associates, which he and partner Al Singer had formed just for that purpose, had 52 black and white episodes of Gigantor on TV screens all over America. Critical acclaim was nonexistent. In fact, the show business trade publication Variety called it "loud, violent, tasteless and cheerless," adding that its only value was as a babysitter, and then only for mentally deficient children. But the kids, even those showing no signs of mental deficiency, loved it, at least as much for its empowered juvenile hero as for the loudness, violence etc. The hero was teenage Jimmy Sparks (Shotaro Kaneda in Japanese), who used a remote control device to make the huge, powerful machine (which could also fly, by the way) do whatever he wanted. Jimmy lived on an island with his uncle, Dr. Bob Brilliant (Japanese version: Dr. Shikishima), who had invented Gigantor. Also present on the island was Inspector Ignatz (no relation) J. Blooper (originally Otsuka), an inept policeman. Giant robots, while not exactly run-of-the-mill, were perfectly at home in Gigantor's world, which was set in the far-flung future year of 2000. If this sounds a little like Hanna-Barbera's Frankenstein Jr., which debuted later in 1966 (but was set in the present day), that's not surprising. Hanna-Barbera was notorious for ripping off other TV shows, such as Sgt. Bilko (Top Cat) and The Honeymooners (The Flintstones). Another contemporary cartoon that was strongly reminiscent of Gigantor was the same year's Ranken-Bass version of King Kong, which also had a young protagonist who controlled a huge monster. Jimmy's voice, in keeping with the tradition that young male roles are often performed by women, was done by Billie Lou Watt (Ma Bagge in Courage the Cowardly Dog, Jack in the English-language version of a Japanese production of Jack & the Beanstalk). Brilliant was Gilbert Mack (whose voice credits are sparse, but who once voiced a goat in a Popeye cartoon). Blooper was Ray Owens (The Flash in The Superman/Aquaman Hour of Adventure}. In due course, Gigantor ran through its 52 English-language episodes. But instead of being relegated to the past like most kids' TV shows, it remained an object of high interest. 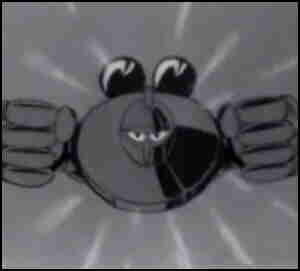 In 1993, Ladd got together with Tokyo's TMS Studio to adapt the 51 episodes of the Japanese Shin Tetsujin 28 into the American New Adventures of Gigantor. Character designs in the new version were sleeker and more modern, but otherwise it was the same Gigantor that viewers had loved for more than a quarter of a century. Gigantor G3 is planned as a robot that's also partly a cyborg — a "cybot", Gigantor for a new millennium. But they're going to have to get past that far-flung future era of 2000 business. Text ©2008-10 Donald D. Markstein. Art © Delphi Associates.